Experience reliable performance while saving money and energy. 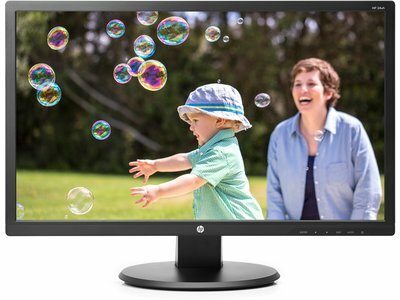 The HP 24-inch LED Backlit Monitor provides a bright, responsive and energy efficient panel. Use as a primary or secondary display for Internet browsing, work at home, or basic gaming. A sleek and versatile monitor for your everyday viewing. diagonal screen size 24 in. dimensions 16.2" x 22.3" x 8"
Ideally priced to use as a primary or secondary monitor for work or play at home. The compact and streamlined design needs only minimal space and is plug-and-play ready. Enjoy the vivid picture quality of the 24-inch diagonal Full HD1 display with the clarity of 1920x1080 resolution, 10M:1 dynamic contrast ratio, exceptional 5ms response time, and VGA, DVI-D, and HDMI connectivity. Adjust your view by easily tilting between -4°~22°. VGA cable is included to connect your computer to the monitor. Screen has non-glare treatment to diffuse bright light. Rest easy with a dependable HP 1-yr parts and labor limited warranty. Additional protection to offset the unexpected with HP CarePacks. Cici567: DVI hookup to desktop provides better resolution and color than HDMI. Kimchi35: I ordered 2 monitors for a double display and the quality is great. Would be nice if they included more than just a VGA cable for instances with connecting more than one monitor but it doesn't change my opinion of the product. Easy set up and great quality. Limited 1 year warranty. Certain restrictions and exclusions apply. 1 HD (High Definition) content required to view HD images. 2 ENERGY STAR is a registered mark owned by the U.S. government. EPEAT® Silver where HP registers consumer display products. See www.epeat.net for registration status in your country.